This book is one of those books that just leave you wanting more. I was hoping for a sequel because I wanted to continue reading about these characters but sadly this is a standalone. One Moment had me filled with emotions. I wanted to mourn with Maggie, cry with her and just plain have a fit when secrets were revealed. That is how good the author wrote this book. I'm not sure how the McBride came up with this story. But she wrote this novel with such raw emotions, almost makes me think this novel was inspired by true events. She was so descriptive with every single event to the point that you grieved along with her characters. Every single moment in this book was realistic, from the second Joey died to the ending of the story. 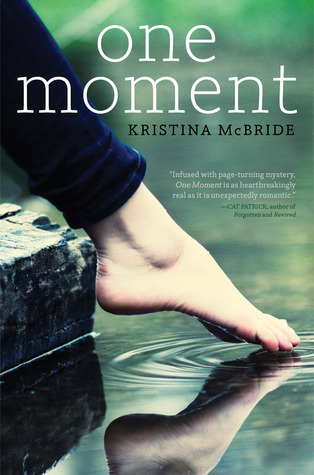 McBride takes you on a twister of events that'll have your eyes filled with tears and your heart filled with sorrow. Hands down One Moment has been added to my favorite books of this year. You know a book is good, when you finish reading it yet you're still thinking about the characters. A blogger friend of mine read this book around the same time and we were texting each other back and forth about it. That's how good One Moment is. This novel has a perfect combination of characters you love to hate and characters you just plain love. One Moment get 5 golden stars and a definite Good Choice for Reading! Oooh yours is the first real review I've read of this book. I have it on my reader waiting for me. Now I can't wait to get to it! I LOVE LOVE it!! A few friends of mine read it too and loved it as well. I hope you love it as much as I do. Ohh wow!! The cover blow me away!!! but then I read the description! I love this kind of histories, mistery everywhere!! On my "to-read-list" now!! thank you for the amazing review, Wanda! I love everything about this book even the cover. I have a friend who has feet phobia and read this book with a post it note covering the foot. So funny. But this book was amazing! !